Theatre architect Carl Fredrik Adelcrantz at the request of Queen Lovisa Ulrika designed the Drottningholm Court Theatre. 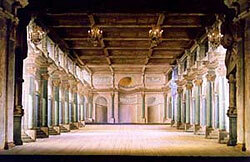 Located on the remains of an earlier theatre, which was destroyed by a fire in 1762, the building was completed in 1766. 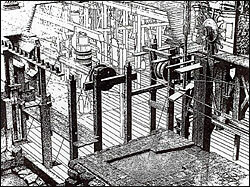 The fly loft conceals a unique piece of machinery made out of wood, which is hand-operated to this day. By the help of manual winches, yarns, drums, blocks, tackles, ropes, bars, counter-weights and a range of other technical finesses can the scenery be completely altered before an open curtain. From interior to exterior, from day to night, from sun to thunderstorm… Around thirty different decor settings are preserved – presenting a historic view into the illusory repertoire of the eighteenth century.